Nagoya City has its origins in the beginning of the 17th century, when Tokogawa Ieyasu, the military leader who was to unite Japan under his feudal rule, built a castle in the location of today's city. Nagoya quickly became one of the country's most vital and vibrant cities, ranking just behind Edo (Tokyo), Osaka and the ancient capital of Kyoto. Nagoya is rich with history, and also has a strong tradition of commerce. It is home to much outstanding cultural heritage, such as the shippo-yaki method of inlaid enameling, and is famous throughout Japan for its culinary specialties too, including delicious varieties of miso, the fermented bean paste at the heart of the Japanese diet. In 2005, Nagoya hosted Expo 2005, the theme of which was “Nature's Wisdom”. The Expo was dubbed the Love the Earth Expo in Japanese, and drew around 22 million people to the city over 6 months. The roots of Nagoya University can be traced back to 1871, when a temporary medical school was built in the city. In 1939, Nagoya Imperial University was established, becoming the last Imperial University founded in Japan and comprising at the time a School of Science and Engineering and a School of Medicine. In 2010, Nagoya University celebrated its 71st anniversary, and over those seven decades the University has carved out a global reputation as the preeminent University in central Japan, a core educational and research establishment that is the driving force of the worldwide automobile industry as well as many other fields of industry, particularly in Japan. Nagoya University has an outstanding record of research achievement and has produced some of the most lauded minds in the world today. The modern University has continued to develop, and today comprises 9 undergraduate schools and 13 graduate schools. Nagoya University is committed to the pursuit of unrestricted academic exploration, and to the education and support of fearless graduates and researchers who are equipped with both the capacity to think logically and the creativity to innovate with vision. Nagoya University remains at the forefront of advanced and innovative research and development in diverse fields, including physics and chemistry (from which fields it has produced a total of 4 Nobel Laureates), mechanical engineering, medicine, biological science and environmental studies. Nagoya University's history of research in physics is second to none. In the 1940s, Dr. Shoichi Sakata worked on his innovative approach to theoretical particle physics, creating the foundations upon which he was to build such core principles as the Two-Meson Theory, the Sakata Model, and the Maki-Nakagawa-Sakata Matrix. Dr. Sakata's enormously important work made possible, in turn, the discoveries of Dr. Makoto Kobayashi and Dr. Toshihide Maskawa, who were awarded the Nobel Prize for Physics in 2008. As well as theoretical research, Nagoya University also has an impressive record of experimental physics in the particle and astrophysical fields. Globally recognized research produced by the University includes the discovery of the Charm quark and the tauon neutrino, and the B Factory experiments which have proved the theory proposed by Drs. Kobayashi and Maskawa. In the field of chemistry, Nagoya University boasts Nobel Laureates here, too, including Dr. Ryoji Noyori who was awarded the Nobel Prize for Chemistry in 2001 for his work in organic chemistry. Nagoya University has also produced a significant body of internationally recognized research findings, including the development of technologies for catalytic asymmetric synthesis and work on carbon nanotubes. The University is now well established as a core institute for advanced research in chemistry, and hosts education and research projects which bring together researchers from chemistry courses in the School of Science, the field of applied chemistry in the School of Engineering, and from the Research Center for Materials Science. Today, Nagoya University is also synonymous with blue LEDs, since it was Dr. Isamu Akasaki and his team at the University who first managed to create a luminous blue LED using gallium nitride. Nagoya University is located in Aichi Prefecture, which is home to Toyota Motor Corporation, much automobile industry and the largest aircraft manufacturing hub in Japan. It is also rich with traditional industry, such as glass, which is related to the earlier artisan craft of pottery, as well as tiles and sanitary ware. Manufacturing industries which are world-leaders in technological innovation, such as photovoltaics and advanced components, are also concentrated in Aichi Prefecture. This concentration of local and international industry allows Nagoya University to form strong links with businesses, and play a vital role in the development of industrial technology and the education and training of industry innovators. For example, many of Nagoya University's leading researchers are involved in the Tokai Region Knowledge Cluster, which seeks to use advanced nanotechnology to encourage the development of the materials and processing technologies that are so crucial to the motor, engineering and aircraft industries that are present in the Tokai region. 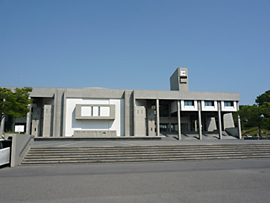 Nagoya University is also proactive in participating in training programs in other fields, such as aviation, where joint international research and development has become the norm. The activities and interests of Nagoya University go well beyond national borders. In its commitment to the promotion of collaborative exchange between industry and academia, the University established the Technology Partnership of Nagoya University Inc. (NU Tech) in 2008, in Research Triangle Park in North Carolina, U.S.A. NU Tech investigates potential collaborative channels within U.S. industry, and promotes information exchange and networking with state governments and U.S. universities. Nagoya University also adopts an international approach to its educational activities, and the presence of so many outstanding international students gives the University campus a truly global feel. In 2009, Nagoya University was chosen to be part of the Global 30 Project for Establishing Core Universities for Internationalization, run by Japan's Ministry of Education, Culture, Sports, Science and Technology. In recognition of this important move towards internationalization, the University is now making preparations to double the number of international students accepted over the coming decade, from the current total of 1500 per year to 3000, and to offer courses conducted entirely in English. In October 2011, Nagoya University will launch its International Programs, designed for international students and Japanese returnees, in an effort to offer to larger numbers of international students the kind of high-level undergraduate and graduate education the University has offered students up until now, and to oversee the development of the next generation of international leaders. Shoichi Sakata was one of the leading figures in particle physics in Japan, along with Hideki Yukawa and Shinichiro Tomonaga. In 1956, Sakata presented work that would come to be known as the Sakata model, a model that proposed that all elementary particles were made from just three building blocks, the proton, the neutron and the lambda baryon, and that all hadrons were made from these particles and their antiparticles. Makoto Kobayashi and Toshihide Maskawa, who were awarded the Nobel Prize in Physics in 2008 alongside Yoichiro Nambu, are all graduates of the so-called Sakata School, having been under his tutelage during their academic careers. Sakata was appointed professor at Nagoya University in 1942. Toshihide Maskawa is a native of Nagoya and a graduate of his local university. In 2008, he was awarded the Nobel Prize in Physics alongside three others for “the discovery of the origin of the broken symmetry which predicts the existence of at least three families of quarks in nature”, or, more simply, the Kobayashi-Maskawa Theory. 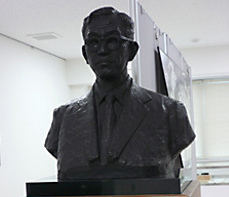 Maskawa graduated from the School of Science at Nagoya University, and received a Ph.D. in physics, during which time he worked in Shoichi Sakata's laboratory. He is currently Director of the Kobayashi-Maskawa Institute for the Origin of Particles and the Universe. Makoto Kobayashi was born in Nagoya and also earned his Ph.D. from Nagoyoa University. He specializes in theoretical particle physics, and was awarded the Nobel Prize for Physics in 2008 alongside his colleague Toshihide Maskawa. Kobayashi also studied under Shoichi Sakata. He is currently an Honorary Professor at Nagoya University. Ryoji Noyori was awarded the Nobel Prize for Chemistry in 2001 for his work on chirally catalyzed hydrogenations. He was appointed Associate Professor at the School of Science, Nagoya University in 1968, becoming a Professor in 1972. He is currently the President of RIKEN, an independent administrative institution dedicated to comprehensive and cutting-edge scientific research across multiple disciplines. Osamu Shimomura specializes in organic chemistry and marine biology, and was awarded the Nobel Prize in Chemistry in 2008 for his discovery of the green fluorescent protein, GFP, from jellyfish. He received his Ph.D. from Nagoya University in 1960, and currently holds the position of Distinguished Visiting Professor. Shigefumi Mori is a mathematician who was awarded the Fields Medal in 1990 for his work in proving the “existence of minimal models for 3-folds”. He joined Nagoya University in 1980 as a lecturer, before becoming Associate Professor and Professor. Isamu Akasaki is principally renowned for his invention of the p-n junction blue LED, a color previously thought impossible to achieve for light-emitting diodes, through the crystallization of gallium nitride (GaN). Between 1959 and 1963 he worked at Nagoya University as Research Associate, Lecturer and Assistant Professor. He was appointed Professor in 1981. Takeshi Uchiyamada was born in Aichi Prefecture, of which Nagoya is the capital. He graduated from Nagoya University's School of Engineering in 1969, and went on to join Toyota Motor Corporation. He was at the head of the team responsible for developing the first generation of Toyota hybrids, Prius. He is current Executive Vice President and Director of Toyota Motor Corporation.